Philosopher George Berkeley asked, “If a tree falls in the forest, and no one hears it, does it make a sound?” What if you went to a tourist attraction that allowed no photos? Could you still enjoy it without a selfie or photographic proof for your Facebook feed? 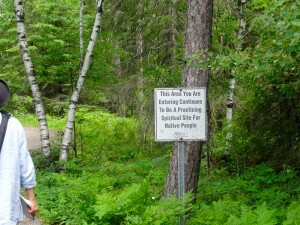 I faced that dilemma at Petroglyphs Provincial Park, 55 kilometers northeast of Peterborough. Six to 11 centuries ago – an era when the Vikings were first arriving in North America – aboriginal people were carving images for ceremonial or spiritual reasons into white marble rock of the Canadian Shield. These 900 rock carvings are now known as Kinomaage waapkong or ‘the rocks that teach’ and the largest known single concentration of Aboriginal rock art in Canada. They lay undiscovered until 1954 when three prospectors stumbled onto the carvings of people, snakes, turtles & other creatures, and told a newspaper. By 1967 there were the same number of annual visitors as today – approximately 12,000 – but no protection. Some tourists wanted to share the glory and carved their initials into the stones; experts feared even the best behaved visitors would wear away carvings with their footsteps. In 1976 a provincial park was created and in 1984 a glass-sided building erected over the petroglyphs. Now a visitor enters via the Learning Place (Visitor Center) before walking three hundred meters to the ‘glyphs’ while putting their cameras away. First Nations “believe drawings are a spiritual being and taking a picture diminishes its spirituality,” explained Park Superintendent, Andy Nicholson. Park Warden, P.J. Fife is Mississauga Ojibway and has worked at the park for eight summers. So could I change? My first instinct at seeing a special place was to whip out my smartphone for an Instagram photo. The Algonquin speakers who carved here had an oral tradition, sharing knowledge through storytelling. I belong to a somewhat narcissistic culture, sharing fleeting impressions through selfies and Facebook posts. Without a picture how could I convey this special place? Would anyone know I’d been here? Perhaps I too was gaining knowledge. Stripped of my social media lifeline, I was relying on my senses to capture this experience, but I was pretty sure that even without a camera, I would not forget my time here. Seeing @PetroglyphsPP Without Sharing via @Reinventure . Click To Tweet. 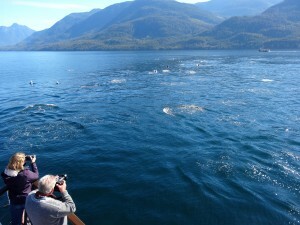 Could you enjoy a tourist attraction that allowed no photos? Click To Tweet. Is Seeing Believing If You Can’t Take Photos? Click to Tweet. “That’s a fairy door,” said Stephen Kerr – well known Ann Arbor resident and artist – pointing to the ground near the entrance of a local music venue. I knew Ann Arbor was home to thousands of artists but I hadn’t realized some of them were small enough to fit in your pocket. Kerr explained that doors built for creatures shorter than fifteen centimeters are found on almost a dozen downtown buildings, “They are perfect replicas of the larger doors they are on.” I peered at the tiny oak door with a miniature stainless-steel doorknob and stained glass window,’ The Ark ‘ scrawled in black ink. Jeff Daniels plays the Ark when he’s in town and I could envision music-loving fairies slipping through the diminutive entrance. “The fairy doors started appearing about ten years ago. Some stores have maps to help people find the fairy doors,” Stephen said. Self-described fairyologist, Jonathan B. Wight, was the first to discover a fairy door in his house in 1993. It’s rumored he’s behind similar doors that started appearing at downtown businesses in 2005. Previously unaware that an urban fairy phenomenon had sprung up in the American Midwest, I set out to find a fairy. Peaceable Kingdom – an art and gift store – has fairy maps, a fairy door and tiny windows peering into a fairy-size replica of the store. I peered through the teeny windows nestled under the store’s street-front display, no easy feat on arthritic knees. A Jack Russell terrier ambled over to sniff my hand, happy to have someone at canine eye level, but the fairies were out. With fairy-door map in hand, I set out on the trail of the littlest residents of Ann Arbor – sometimes called A2. It appeared fairies hung out in some unlikely places. 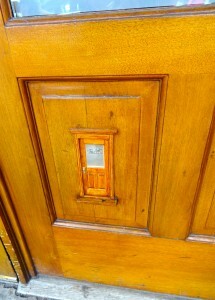 Google’s AdWord headquarters has a fairy door, as does the University of Michigan’s MOTT Children’s hospital. The university is one of the world’s foremost research schools but it’s not above a bit of whimsy with its own fairy door. At the Kelsey Museum of Archeology there are no fairy doors but the Egyptian coffin of Djehutymose has its own Facebook page. Somehow separated from its mummy, social media is helping Djehutymose. “Other mummies have liked its Facebook page and there is some discussion on the page about finding the missing mummy,” laughed Terry Wilfong, Professor of Egyptology. I wondered if the fairies could help. My next destination was Matthaei Botanical gardens. I skidded to a stop at a large display inside the front door. A sign extolling people to ‘Build your own fairy garden’ was surrounded by tiny chairs, birdhouses, and even miniature wine bottles for the fairy with a preference for Chardonnay. “Have there been any sightings?” I asked Allison Correll, Visitor Services & Events Supervisor. She just laughed but I wondered about this Michigan preoccupation with fairies. If they were real, why settle here? It could be the food. 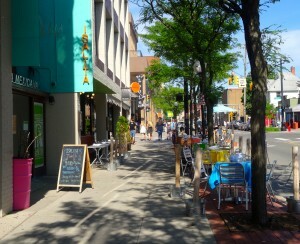 With over 200 restaurants, 65% with fairy-friendly outdoor seating, Fodor’s Travel called A2 one of “America’s Best College Towns for Foodies.” Maybe it’s because Ann Arbor decriminalized marijuana in the 1970s, or perhaps that just accounts for the number of people who think they’ve seen a fairy! Thinking a bigger lens might help spot fairies, I headed to the Detroit Observatory, the second oldest building on the University of Michigan campus. Nearby Great Lakes create dreadful astronomy conditions, but in the mid 19th century it was necessary to have a planetarium if one wanted a research school so one was built. Even a fairy might find that logic confusing. As my tour group watched Program Coordinator Karen Wight point the telescope towards the sky, explaining how early astronomers sighted stars, the doors to the room slammed shut – apparently on their own. “It’s the fairies,” cried one of our group. I spun around; it might have been a trick of the light, but for a second, I thought I saw a gossamer wing slip under the door. An Urban Fairy Phenomena? Click to Tweet. Fairy maps and fairy doors are a common feature in Ann Arbor. Discover how it got its start: Click to Tweet. Discover how a trip to Ann Arbor could have you seeing fairies: Click to Tweet. Have You Added Friluftsliv to Your Life? “Should I turn back or risk calling out Norway’s search and rescue service?” I asked myself. I’d been hiking for over an hour, my knees aching from the relentless climb up Stedjåsen Mountain. 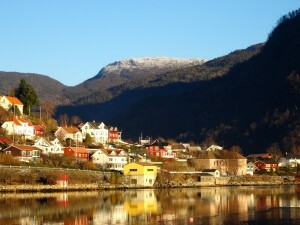 I had seen no one in my search for a better view of Sondefjord, Norway’s longest fjord. With sunset at 3:30 p.m., lingering past 4 p.m. meant returning through rocks and cow poop with nothing but a flashlight for illumination. I was investigating the Norway concept of friluftsliv, loosely translated at open-air life and a point of pride for Norwegians. Learning outdoor skills is enshrined in the school curriculum and law guarantees people rights of access across open land. Stores close mid-afternoon in small town Norway on Saturday and do not open again until Monday. Weekends are for exploring the outdoors with family – hiking in the summer, skiing in winter, or gathering berries if your knees are shot. I remember in Grade 12 being told Canadians needed to do more physical activity as a 60-year-old Swede could outrun us. After spending a week in Norway, I’m pretty sure the Norwegians could take us too. I was in western Norway to speak at the International Adventure Conference – a gathering of academics, business owners and experts interested in the latest adventure research. At the conference we debated whether friluftsliv could be exported to other countries, and we experienced the philosophy first-hand with two days of outdoor adventures. I paddled the fjord in heavy rain, glad for spray skirts and Gore-Tex. Dinner at a 1760 farmhouse started with cocktails in a garage-like structure; the only warmth from a small fire and cider made from local apples. I welcomed mornings with fresh air and exercise including outdoor yoga. That meant triangle pose in the cold, in the rain, and in the dark – sunrise in November is after 8:30 a.m. I felt like I was in a Druid ceremony as twenty people from around the world did their best warrior pose, surrounded by flaming torches in a forest clearing. Water dripped down our faces and smoke tickled our noses. A rare Norwegian dog out for his morning walk barked in surprise and a TV crew appeared. Proof perhaps, it was possible to go too far with the quest for outdoor life? As I realized my final outing was not leading to a viewpoint of the fjord but to the top of a mountain, I decided the only safe outdoor activity in the dark for me was yoga. Picking my way down a mountain by flashlight was more friluftsliv than I wanted. I turned around but vowed to bring home the philosophy of getting outdoors no matter what the weather or amount of daylight. Have you considered whether more frilutfsiv would enhance your life? Learning outdoor skills is enshrined in the school curriculum in Norway. Learn more about why it is important: Click to Tweet. Adventure Takes Over The World? Get ready. Adventure is taking over the travel world. Once regarded as a niche within the travel industry, it has grown rapidly in the past two decades. Now, Phillippe Duverger, PhD Consulting, predicts all travel will become adventure travel. “What is an adventure?” Duverger posed at Canada’s Travel Tourism and Research Association conference, noting that dining out can be called an adventure as can summiting Everest. He suggests that as mass tourism organizations incorporate adventure activities and terminology into their businesses, adventure may become a state of mind. If global corporations put their marketing muscle into selling adventure, it will be hard for small-scale adventure companies to distinguish themselves. Duverger’s research done in conjunction with the Adventure Travel Trade Association, suggests that instead of describing adventure as hard or soft, we will move to the categories of grazers (someone checking off high thrills on their bucket list), adventurers (working on their skills) and enthusiasts (people keen on one activity, higher skill, going to unique locations for their sport). Never have words seemed so powerful; their ability to redefine an industry will impact many of us. For if we are all having adventures, how do we delineate those tours and activities that carry higher risk? Adventure is taking over the world. Get ready! Click to Tweet. Find out why adventure is the new way to travel! Click to Tweet. Adventure and travel…do they really go together? Click to Tweet.